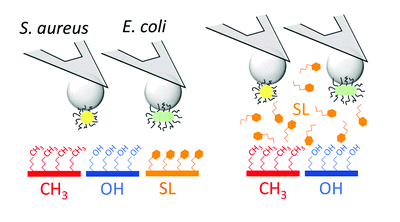 Many bacterial pathogens attach to biomaterials such as catheters, and grow to form biofilms. These surface-associated multicellular communities cause infections that are difficult to eradicate. Antiadhesion therapy represents an attractive alternative to antibiotics to prevent and treat biofilm infections. Using single-cell experiments, we show that glycolipids feature unusual high-efficiency and broad-range antiadhesive properties against Gram-positive and Gram-negative pathogens, making them ideally suited to fight biomaterial-associated infections. Our study show that glycosylated substrates, classically used to favor protein and cell interactions, exhibit strong antifouling properties that could be used to design anti-infective biomaterials. Want to know more about it? Read the article right here!